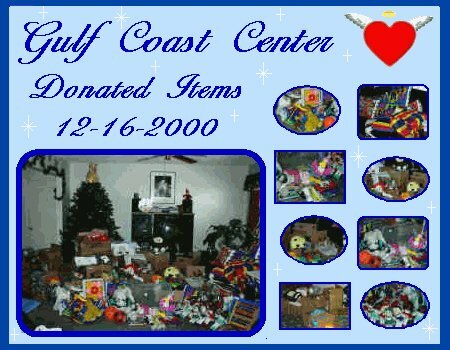 Gulf Coast Center – TLC for Angels – Charity group crafting handmade knit and crocheted baby clothes and items for preemies and hospital confined children. Pictures of the Christmas Delivery coming soon! Santa Claus is Coming... to Monroe Cottage! Just wanted to send a "thank you" to all of the kind volunteers of your organization for the lovely festivities Saturday. I was not able to be out here that day, and staff expressed what a nice afternoon they had. The presents were so thoughtful, and greatly appreciated! You are all ANGELS! What a suitable name for the group! Thank you again, from the bottom of my heart. Please extend my holiday wishes to everyone! Preparing for the Special Buddy party was an exciting time for myself and Kaye. When I say we were standing knee-deep in gifts to prepare for delivery, that is an understatement. First off I want to publicly thank not only Kaye for taking in all the mail deliveries, but to also thank her husband Slim for being ever so patient having to maneuver around all the boxes that Kaye was storing, as they took up space in two of their rooms. Upon arriving in Florida on thursday evening, Kaye and I made arrangements for me to be at her house early friday morning to start the wrapping party. I was up and out by 7:30 am to drive to Kaye's, who she was the perfect hostess, she had coffee ready for us to help wake us up so we could be alert enough to sort, log, wrap, and label each gift. After bringing all the packages out from her two bedrooms where she had them all stored, we managed to fill half her living room, trailing into her dining room with boxes. Being that there were so many items to view, we took several overall pictures instead of one by one pictures. If I had taken one by one pictures, I would not have had enough pictures left in my digital camera to cover the party, and even then we had to take the pictures in sections to be able to get all the gifts in. We divided her family room into 2 sections, one side being for the girls presents and the other side for the guys. It was exciting for me as we opened box after box, as I once again was able to see not only how generous each and everyone of you are but also how much thought everyone put into what they sent for their buddy. After numerous hours (approx. ten hours worth) of logging all gifts into the log that I have to keep for the Non-Profit records, and wrapping, we were finally completed and ready for the party on saturday. Somewhere during that time though, we realized that even though I had rented a van that I traveled to FL in it was not going to be large enough to transport all the gifts and Santa and his family. So I called Brenda of Monroe Cottage and she was able to obtain a state issue van to meet us saturday to help transport everything. Saturday morning we were up bright and early; the day was extremely sunny and hot, with temperatures that went up to 89 degrees by the time the party was to start. Thankfully Kaye had suggested the day before that Santa should dress at her house rather than at the hotel, as her house was closer to Gulf Coast. We arrived at Kaye's where Santa proceeded to get ready; Santa's helper, Jack, was kind enough to not only wear the Elf tunic that I had gotten him, but was a good enough sport to also wear the Elf hat with bells on it and the curl toed shoes that I had found as well. He looked adorable, and Kaye made an adorable Elf as well in her red shirt, black skirt, green tights, red curled shoes and red hat that jingled when she walked. Aand then there was me, who was Mrs. Claus, dressed in a long red skirt with a white ruffle and white apron, red shirt with a red Christmas print vest and a white ruffled cap and black boots. Brenda arrived at Kaye's with her van. She was absolutely speechless when she saw how generous everyone was with their gifts. She couldn't express her thanks enough. Everything was loaded into the two vans, Santa climbed aboard his Astro Sleigh, and off we went trying to obey the speed limit, as we tended to want to hurry a little since Santa was already starting to feel the high temperatures in his very PLUSH suit even though I had the AC cranked on high in the van. We arrived first at the Monroe Cottage, where we were joyously greeted by the staff members that were on duty for the party. The Monroe Cottage dining room was festively decorated, just as you or I would decorate our house for the holidays. They had holiday color tablecloths on the tables with festive table runners and a centerpiece on each table. They had Christmas garland strung along the walls of the dining room, refreshments and Christmas cookies arranged very nicely, and a wonderful decorated Christmas tree all ready to receive all the wonderful gifts that Santa had brought. The gifts were placed under the tree so we could take pictures of Santa and his family before the Buddies arrived. As we were waiting for the staff to arrive with the Ladies, I guess Martise was too anxious to wait to be escorted to the party. She decided to go out the front door of the cottage, around the house and came in the back door of the dining room; she pulled out a chair and sat down as if to say, "Ok, I am here, let's party", and proceeded to patiently wait for the others to arrive. She was so cute. The staff felt that bringing in the Ladies a little at a time would be the best way to proceed with the party. They were concerned that if they were to bring everyone in at once, it would be too overwhelming for the patients. So the party happened in stages. The staff did a wonderful job of creating a party atmosphere for the patients. All the ladies were dressed in party attire, some in velvet dresses, silk dresses, fancy suits, a very holiday feel was present. As the ladies arrived, Santa became very busy handing out gifts, Mrs. Claus was extremely busy trying to get candid shots of them receiving gifts from Santa, Elf Kaye was busy helping the ladies open their gifts, and Elf Jack was busy finding the gift with the name of the Lady that was ready to get her gift next, and handing it to Santa for him to present. It was extremely touching to watch the different reactions of the Buddies as they received their gifts. You could sense that they were not used to getting such special treatment and love. Some of the ladies were relishing in the attention, others were more reserved, and everyone enjoyed the refreshments and cookies. Some ladies were a little intimidated by Santa, they didn't know really what to make of him. Others found him fascinating, and one girl in particular found him hilarious. When Santa would try to talk to her or look at her She would put her head down and look at the floor. But when he would turn away she would quickly look up, stare at him and just laugh the heartiest laugh; but as soon as he would turn around again she would look back down at the floor. There were numerous hugs given, both by Santa and his family, and the staff, so not only did the ladies get wonderful gifts, they received a lot of love that day as well. Brenda and her staff said over and over that they could not believe the generosity of everyone, and they could not thank us enough for choosing their cottage for our project. The party lasted about an hour and a half. As the ladies party was happening the staff took the second van to Pearce Cottage to unload all the gifts for the guys and put them under their tree for us. We said our goodbyes to all of the ladies, jumped into the Astro Sleigh and off to Pearce Cottage, the men's cottage, we flew. Once again, we found that the cottage had been decorated in a festive manner, complete with a fully decorated tree and refreshments and cookies for the party. Pearce Cottage had all the gifts arranged under the tree in the order of how they were bringing out the fellas. Each gentleman was brought out by Patrick (head of Pearce) and introduced with total respect. Instead of introducing by first names, he would introduce as Mr. Smith or Mr. Jones, etc, then followed by his first name so Elf Jack could find the gift that Santa was to give. Elf Kaye was busy getting a Cartoon Character pillow, crocheted Stocking filled with candy cane and a plastic canvas Christmas Santa basket filled with Christmas goodies ready for Elf Jack to give to each Buddy as they were leaving to go back to their room. Again, some Buddies were festive and happy when seeing Santa, others were intimidated. One fella in particular, was extremely shy. When Santa would try to give him his gift, he would put his hand over his eyes, as if to hide, and shake his head no. Santa was patient, tried several times to give him his gift and finally laid the gift on the chair next to the Buddy. He turned around to walk away, when the Buddy jumped up, grabbed Santa around the neck and gave him the biggest hug. Another fellow would look at Santa, just nod his head up and down, and smile like the Cheshire Cat, with a definite twinkle in his eyes as if he knew who Santa was and was happy to see him. A Buddy took a liking to Jack, another to Kaye and another to myself. There are no proper words in the English dictionary that can truly describe the feelings and emotions I experienced on December 16, 2000. This day will forever be embedded in my memory. I am so glad that we chose Gulf Coast Center as our Christmas Project. It was truly the best description of a phrase that I have heard all my life, that phrase being, "It is better to give, than to receive" , and I found the true meaning of this phrase. The only thing that I regret is that each and everyone of you could not attend the parties to see how TLC as a group made a difference for these patients. Santa was extremely quiet after the party; we thought it was from being over heated from being in the thick hot suit for hours, as the suit was definitely like a sauna. In discussing with him later, he explained his quietness; he tells me that each Buddy he handed a gift to, he could see into their eyes, he could see that there is a person behind those eyes, trapped in a body that has no means to properly communicate. He was extremely affected by this, as he said it must be so frustrating for them not to be able to share their feelings. And being that he could see that there was feelings behind those eyes, he was deeply troubled and upset that the families of these Buddies have given up on them. Santa felt honored and lucky to have been given the chance to make a difference in their lives, even if it was only for a few short hours. The staff was totally surprised when they were presented with gifts as well. Each and every one that was present at the party who received a Snowflake (which was not only handmade but also had their personal name on the label) was amazed at the hard work that went into these gifts. They each remarked that they were going to take their gifts home and hang them on their trees . Brenda will make sure that all staff members on all shifts will receive their snowflakes as well, and extended warm thank yous in behalf of all staff members. Patrick of Pearce Cottage is going to have a special frame made and will make a picture collage of the TLC Christmas at Pearce Cottage, and he says it will be displayed in the cottage with great pride. Both he and Brenda took numerous pictures with their own cameras, as I was taking with mine and Kaye was taking with hers. Hopefully we will get copies from everyone's cameras. Again, everyone, you deserve a round of applause and a standing ovation for a job well done, above and beyond the call of duty. As Tiny Tim Said, God Bless Us, Every One. On December sixteenth TLC for Angels, a nation-wide charity group that hand crafts items for four hospitals a year, delivered one of their projects. This project was for Gulf Coast Center in Fort Myers, Florida, a home for mentally handicapped resident patients. TLC held a holiday party for the patients. It was a wonderful success. 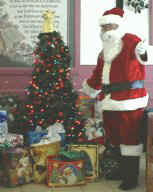 All of the TLC volunteers worked very hard to bring some joy to these patients. It touched our hearts so deeply. Some of the girls weren't too sure about all that was going on. The strange looking big man in a red suit, with all that white hair (it was 89 degrees and Bob was wearing a plush Santa suit), the pretty lady also dressed in red, and the other two strangers walking around with funny hats on with bells that jingled and shoes that had curled toes, also with bells. And there was the tall big man who knew each and every name. There were so many occurrences that brought smiles to our faces and tears to our eyes. The one that stands out the most in the girls' cottage was the second girl to receive her gift. She found a Sun Bonnet Sue stuffed doll in her gift. Now realize that she can't talk, but she let the whole group know that she loved that doll immediately. The gentlemen were much more reserved; some were blind but they enjoyed the sound or feel of their gifts. George was such a shy little guy. Imagine this: he is not more than 5 ft tall and in a wheelchair and he is one of the older ones there, probably late 30s. He has the sweet little cherub face. Looking up at Bob and smiling, looking at Vickie and smiling. Just over and over these sweet little smiles appeared. He loved his gift and when he left he said goodbye. Another patient who received a lapghan wrapped himself up immediately in it from the top of his head to as far as it would reach, and cooed. Chuckie, the one who loves Oreos, received an Oreo blanket and a Tin of Oreos; he was draped with his blankie, trying to eat the BIG Oreo. I could go on and on. The staffs of both cottages were so very helpful and caring, helping their clients to open and see their gifts. And giving them the snacks and drinks that Brenda (the house Mom) supplied for the girls. The boys for the most part didn't care about the snacks. They all enjoyed the gifts we gave them from our hearts. I know even though they could not express thanks, it was there. As Tiny Tim said, God bless us, every one.